Ten days that allowed me to enter the studios and working spaces of these professional calligraphers and instructors. They work within D.C.’s unique environment by not only freelancing for its cultural agencies, but by also handling weddings, corporate needs, and personal commissions. These are the people we approach with our everyday artistic and calligraphic requests. They are a fair representation of those individuals who comprise D.C.’s calligraphic underground. The goal was not gathering their résumés, rather their philosophies—the ‘how’ and ‘why’ of getting to where they are now, not necessarily the ‘what.’ They allowed me to ask the not-so-usual questions. What was their first calligraphic memory? How did calligraphy introduce itself into their lives? Did they seek it? Was it a response to some event or experience? Was it a discipline to be learned? Is calligraphy a way of thinking? How important are other talents in calligraphy (i.e., color theory, illustration, design & layout, painting)? What was their most valuable mistake? How do they troubleshoot their projects? Is it a sequence of corrections, or do they start all over? Could they recognize their calligraphy anywhere and mixed in with other people’s samples? Is calligraphy like a signature or a fingerprint? Who influences them artistically? Are these individuals traditional, contemporary, or experimental in what they do? Who taught them? Why do they teach? How important is formal study? How do they motivate themselves? Do they document their work in any way? Do they advertise? What projects do they take on? Are there any they would refuse to do? Have they noted any trends in calligraphy over the years? Is calligraphy reinventing itself for the newer generations? 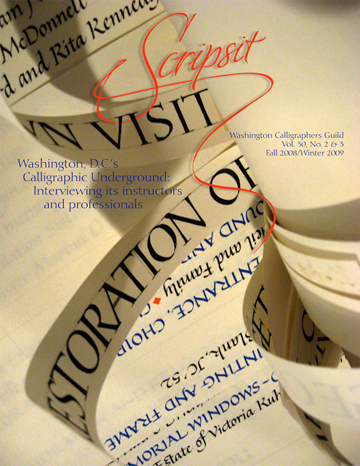 I was the writer, photographer, designer, and editor of this special 52-page, double-issue of Scripsit, the journal of the Washington Calligraphers Guild. This issue is available for purchase through Paper and Ink Arts. A complimentary copy is provided to members of the Washington Calligraphers Guild. If you have read this issue, feel free to leave your thoughts and feedback. I would love to hear from you and would find your comments insightful for future endeavors. Below is a selection of articles for three of the ten artists. Enjoy!